If you are in the market for a new home with all the bells and whistles, that’s also conveniently located just minutes to I-65, then come by 9520 Elmbrooke Blvd. in the beautiful new Elmbrooke Community just off Crockett Road next to Hampton Reserve in Brentwood. With four bedrooms, four and one-half baths, and boasting a spacious 4,226 square feet on two levels, 9520 Elmbrooke is offered at just $724,900 and has every custom detail you’ve ever wanted in a home – and it was all done for you. The kitchen is the heart of a home. This kitchen is spacious and bright and opens to the family room, but not the second floor, so you won’t get the noise carrying effect of so many new homes. It features a stainless steel Frigidaire cook top, oven and dishwasher. A beautiful tumbled tile and stone backsplash compliments the striking granite countertop. Custom cabinets feature soft close, pull-out drawers and a pull-out trash can. The attached family room also features a convenient wet bar with custom built-in wine storage, a stainless steel sink and granite counter top – perfect for entertaining a large crowd. A cozy fireplace is flanked by custom shelving and a built-in spot ready for your flat screen television. Lots of windows allow natural light to filter in and beautiful French doors lead to a relaxing covered back porch with a ceiling fan. The main level Master Suite has his and her closets and sinks, so you have your own personal space. A large, oval, relaxing tub sits just underneath a large picturesque window – a perfect spot for relaxing after a long day. A sophisticated chandelier hangs in the center of the room which compliments all of the modern details that this tasteful yet functional bath offers. The outside of this home is as impressive as the inside. Area buyers know a covered front door is a luxury in middle Tennessee. The home features an entire front porch with space to sit and watch the kids ride their bikes and play. You’ll appreciate it on those hot summer days. But if having two porches to relax on isn’t enough for you, check out some of the other unique interior features of this flat, half-acre, three car garage home. From a built-in cubby station near the garage entrance – every mother’s dream – to the gorgeous bath cabinetry you would have picked yourself, to the custom built shelving in the closets, to the downstairs guest room, each detail has been thought of for you. Other custom features include the modern oil rubbed bronze and stainless steel fixtures, granite countertops in the bathroom, pleasant ceiling fans, wrought iron railings, nine foot high doorways, sparkling hardwood floors and stunning crown moldings. For your entertainment, tell the kids the media room is wired for surround sound and ready for you to enjoy a movie. 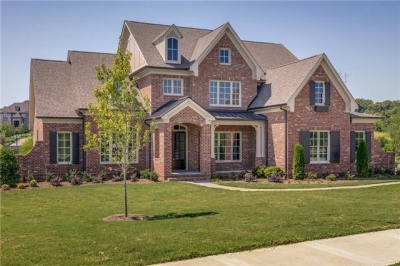 9520 Elmbrooke is built by distinguished homebuilder Legend Homes, which is also building Annadale, Edenbrooke, Elmbrook, Legends Ridge, The Grove and Westhaven . It is zoned for Crockett Elementary, Woodland Middle and Ravenwood High. Please call Andy or Doug today at 615-642-6700 today for more information, or to tour it. Click here to view the complete property listing.